NOTE: We went to see the unique Dattagiri Ashram about 20 kilometers from Hyderabad going toward Vijayawada. It is about 15 kilometers from Ramoji Studios. Please read about the true story behind the construction of this Dattagiri Ashram on a top of a mountain overlooking miles of open land, greenery and mountains. We reached Mysore on July 20, 1999, and our participation was scheduled on 21. We went to Venkateswara Swamy temple but could not find others and there was no one to whom we could pay the amount for Puja. We saw Swamiji sitting in Garbha Gudi and went and sat at His Feet. I was completely lost and did not know what was going on. The whole universe seemed to be consisting of Swamiji everywhere. My wife saw Swamiji in the form of Vishnu coming down from heaven and continued to see Him in the same form till we finished the Puja. It was indescribable scene and condition in which we found ourselves. 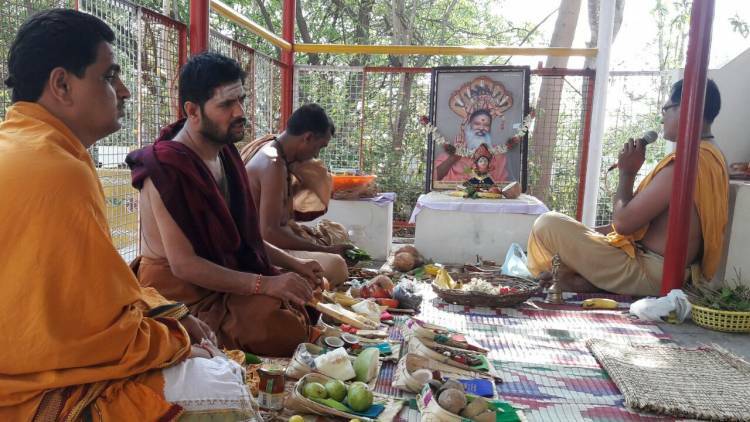 After finishing the Puja we thought since we performed Mandal puja, why not visit Tirupathi and perform Kalyan Utsav, knowing the difficulties involved in booking for different Pujas at the last minute. I called a friend in Hyderabad to make reservation for the puja and a room to stay. We started for Tirupathi in the train having confirmed the reservation. The train reached Tirupathi late in the night at 11 p.m. We went to the Chairman’s office and saw lot of activity going on. I was told that Chairman is waiting for a relative who was expected to arrive soon. As soon as we mentioned our name, the persons in the office gathered around me and told me that I was the person Chairman was expecting. I was assigned a room. I took the key and headed toward the room. All the puja tickets I had purchased had “chairman, TTD” stamp on it. In fact, I did not even know the name of Chairman and since it would not be appropriate to inquire there, I found out later. After my return, I came to know I was transferred to a place called Pochampalli, near Hyderabad. I kept pondering about Swamiji, started to listen to His cassettes, read about Datta Charitra, as Paarayana. I did not know much about spiritual matters nor did I know any mantra or rituals to be observed in performing Puja except to prostrate in front of God’s picture. One question kept coming to my mind, “Who am I? Who is the guru? who is Datta?” I did not get any answer. While going through mental turmoil, I received a call informing me that Swamiji was doing Paada Yaatra and Paada Puja is being in different houses of devotees and my house is included in the list. I was not able to understand the concept of Guru and now in addition this message of Pada Puja. Initially, I refused but I received two to three calls suggesting that I should think it over and finally I accepted the request. The Pada Puja was to be performed in January 2000, but I was still hesitating about doing it. At that time, I was informed that my name was registered for Shivaratri in Haridwar near river Ganga. Swamiji came to our house on January 30. We performed the Pada Puja and it was satisfying. After the Puja He called our whole family in separate room and asked us what we wished. I was speechless. My wife said, “please visit us now and then” and started sobbing. Swamiji calmed her down and said I am in your house always. Learn to see me. Saying this, He gave us Prasadam. We went to Haridwar. Swamiji said, “River Ganga is behind and you are in it; your Guru is in front of you, Ganga River is behind you, and you are in between. You are all very fortunate: Ganga Snanam, Shiva Linga Abhishekam, in addition Sahasra Linga Abhishekam on the banks of Ganga, Swamiji’s Sri Chakra Puja in the flowing water Ganga.” Six days passed without realizing time. Amidst all this I felt peace of mind that I never felt before. Swamiji asked the devotees to visit Rishikesh. When I was working in Astha, I had the opportunity to visit Rishikesh twice. I had read in Datta Charitra that Sahyadri mountain range resembles the ranges in Rishikesh. I thought this Ashram here at least would be surrounded by hills but I was utterly disappointed. I was sitting in the temple with Swamiji’s smiling face in the picture in front of me on one side and Dattatreya’s picture on the other side. I started thinking to myself how come Swamiji has not constructed Dattatreya temple among hills. His Ashram is big. Then I asked myself why He should alone build; why can’t I build and give it to him. This thought kept haunting me all the way back from Rishikesh to Haridwar. I was obsessed with the same thought on the way back from Delhi to Hyderabad and even later. The land near Pochampalli was hilly with natural beauty and while going to work I used to feel peaceful walking over there but never thought of building a temple. There was peace on the land. After returning from Rishikesh I kept thinking of building a temple. I knew a realtor by the name of Mr. Reddy who owned about 150 acres of land and realizing that I was looking for a hilly region to build a temple he consented to give me five acres of land and also provide assistance in related matters. I was excited that at least land was found and I went to Mysore to inform Swamiji. I did not know anyone in the Ashram. How am I to inform Him? I met the accountant T. R. Das Murthy and asked his advice. He suggested that it would be difficult to meet Swamiji at that time and that it would be better if I could sit in front of Swamiji’s picture and Padukas and meditate and present my Sankalpa and Swamiji would come to know about it. I still went two to three times without much success of meeting Swamiji personally. In December 2000, I decided to build a temple without help from Dattapeetham or anybody and donate it to Swamiji. Unfortunately, Mr. Reddy also could not fulfill his commitment due to circumstances. In 2001, I resigned from the bank due to a scheme started by them. I was 52 years old. I searched for the land for almost a year. I found the present land in 2002. I created a Trust to start the project. The seed planted in my mind in Rishikesh started to sprout. From then on tests for my efforts started. The region was hilly with no roads, no water supply, and thorny shrubs all over, with absolutely no access. I was lost for a while but had firm faith that Swamiji would be with me and continued my efforts. One day I met unintentionally a scholar by the name of Aripiral Vishwamji through a friend, A. V. Sharma. Vishwamji was a Sri Vidya Pasay and had written several books on the subject. I mentioned to him my interest in building a temple on the hilly region. He got mad and suggested that I should not take up this endeavor. I left it Lord Datta, but, in forty-five days Vishwamji came back and mentioned that every day, Devi was appearing in his dream and telling him to help in my efforts. Consequently, he committed himself to help the project. 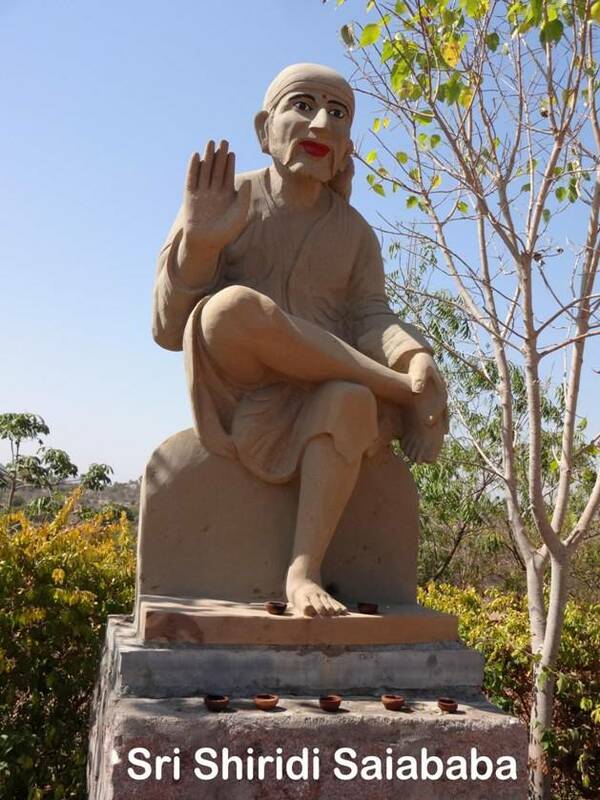 On July 14, 2002, on Panchami, Sri Vishwamji came with his disciples and climbed the hill with great difficulty and kept five stones at the place to indicate beginning of the temple and blessed me saying, “You will build a beautiful Ashram and donate it to your Guru. But, for seven years it is a time for test. Nine years from today this year will develop.” He named the place as Dattagiri. My late father, Sri Ramarao, had given first donation. He had mentioned to me to start the Project as soon as I could. He was the first Trustee and as he was a supporter, we scheduled the Prathishtapana for Sri Chakra and Paadukas on his birthday, June 10, 2002. 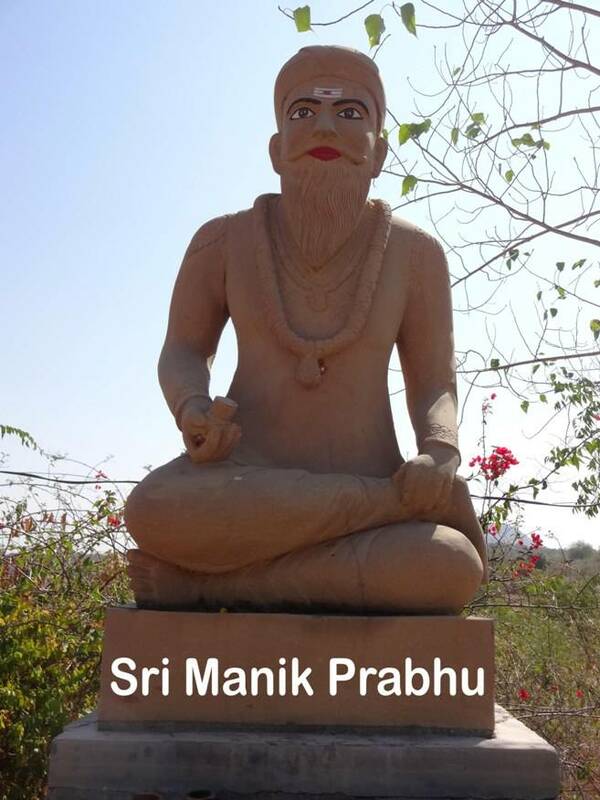 Having heard about the Prathishtapana date, Sri Maulana Baba sent word to us saying that he was planning to visit the place. I had heard about him but had not met him and was not sure the reason for his visit. Similarly, Beemli Guru, disciple of Sri Sivananda Murthy was sent to search for Dattagiri. It was a surprise for me. In 1980 Sri Sivananda Murthy while travelling from Hyderabad to Vijayawada, had stopped on the highway near the road that turns toward Dattagiri and asked one of his disciples to go inside the forest and search for a temple. At that time there were no roads to this place except thick forest. The disciples could not find anything. As soon as one of the main disciples heard about the Project, He informed Sri Sivananda Murthy. That disciple was asked to go personally for Prathishtapana. We did not have water and electric connection, road to the place, did not have bus or transportation arrangements but when Prathishtapana took place more than 2000 people were served Prasadam for two days. We erected a Panda about 2000 sq. ft. for the Prathishtapana ceremony of Padukas. Gradually, construction of the temple started. We faced several difficulties: putting pillars, digging holes, etc. Those who specialized in digging holes said it is difficult because the land was hilly and trucks would find difficult to drive there. I contacted Jagayyah, tractor compressor dealer whom I met while granting loan from the bank and he accepted the responsibility of digging holes and he did it miraculously. How he managed, Lord Datta only knows. Every facility that had to be provided was difficult; roads, electricity, water supply, cement truck, sand trucks, etc. Construction was progressing and I was solely devoted to this project to the extent that I did not even think of Swamiji. We finished Garbha Gudi and the slab, etc. In 2003, Swamiji had come to Dindigal Ashram for Ugadi. I went to meet Him two days after Ugadi. I was new and did not know anybody there. I inquired with the people around and somebody suggested that I should see Vamsi Krishna Ghanapati who was at the Ganesa temple then. He asked me to come back the next day by 3:30 p.m. with an engineer. As suggested I took my engineer friend to Dindigal. When I reached there the Ashram was flooded with devotees and many VIP’s were waiting in line to perform Pada Puja. Sri Vamsi informed Swamiji about me. Immediately, Swamiji requested the people in the room to vacate and called me in. His main devotees who cater to Him were present. My engineer friend, Sanjeeva Rao and I entered the room. Swamiji smilingly asked me to come in and made me sit at His feet. Before I said anything, Swamiji, addressing the attendants there said, “I asked you while travelling back and forth to Hyderabad and Vijayawada whether Dattatreya temple being built by person working in the bank was completed. Did he meet you? I asked them several times. He is that person and pointed at me.” He also said, “It took so long for you to come.” I was stunned and speechless. I had never mentioned to Swamiji about the project I had undertaken. Smilingly, He proceeded to ask me the purpose of my visit. I answered saying, “I request you to: (1) please be behind my endeavors and help me to do Seva; (2) give me idol of Dattatreya; (3) attend the Kumbabhishekham ceremony.” Swamiji responded saying, “I am always behind you. 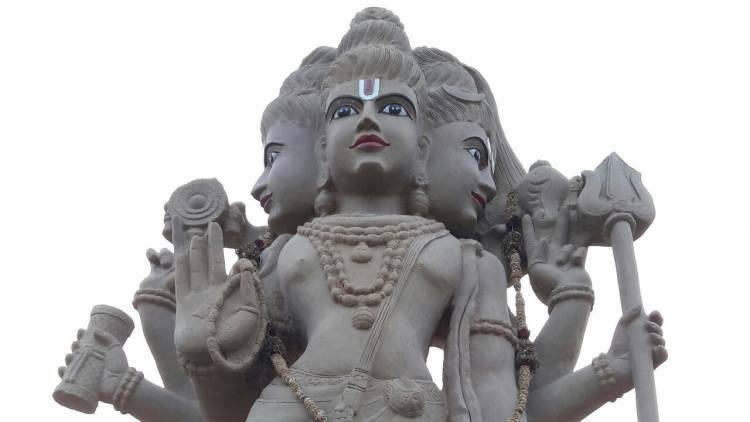 I will give you idol of Dattatreya. I cannot attend Kumbabhishekham nor can I give any kind of other help. You have to handle everything yourself. I will bless you and gave me Raksha.” I showed him the progress of the temple. In December 2004, Swamiji visited Vijayawada. 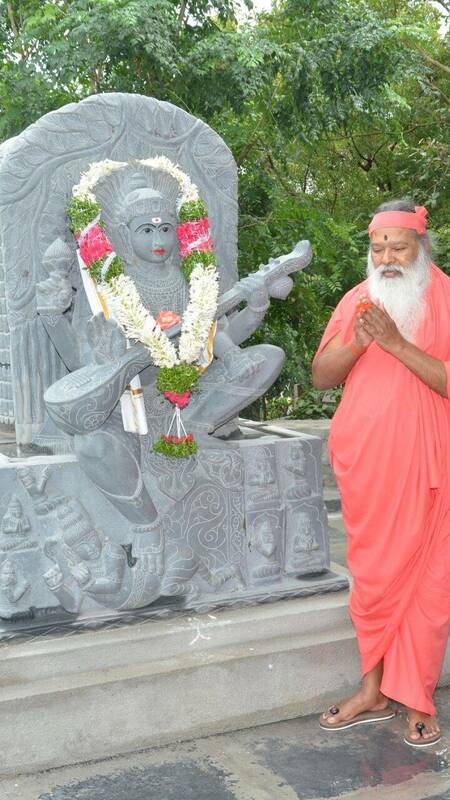 Sri Vamsi called me to come to there to take the Dattatreya idol. I took some Trustees along with me in a van. The idol was ready. Swamiji came over, put garland around it and said I could take it. He walked a few steps and came back and asked Sthapathi Subramanian how many days it would take to sculpture idol like it and his response was “one month.” Swamiji turned toward me and said, “Don’t take this, take another idol in a month. 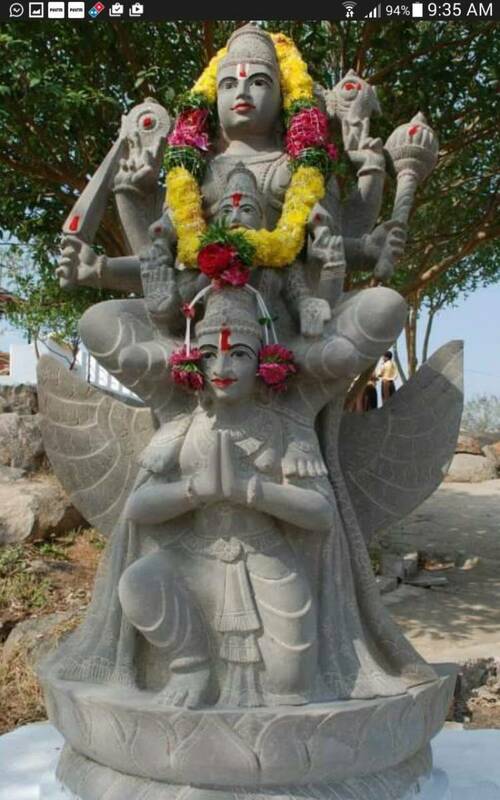 This time it would be Gyana Dattatreya in a sitting position; head on the sides should be facing sideways and not look straight ahead.” I was disappointed again. He asked me to come a month later. Two days later Sri Vamsi called asking me to come and take the Murthy. I was astonished but I went there. The heads on the sides had eyes looking sideways. 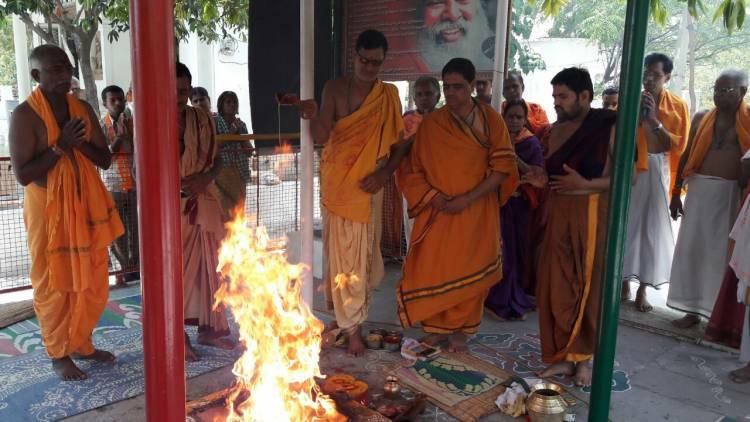 I was puzzled, how could they do it so soon!” After Aditya Homa on Sankranti day I took the idol from Swamiji and returned to Datta Giri. In the same year Kumbha Mela was held at the banks of Krishna River and I participated in doing Seva in Swamiji’s programs. Since then, I have been destined to offer my Seva in several ways and I consider my involvement as Prasadam given by Swamiji. Devotees experience the presence of Swamiji in Dattagiri and have their own stories to narrate. Swamiji, finally visited Dattagiri. He said it is His body and those who stay here will be like in His laps. He said the place is not a Kshetra but a very important spiritual center. Doing Pradakshina is similar to doing Pradakshina to Kailash Mountain. The experience of creating a Center shows how Swamiji can enable an ordinary person do unimaginable tasks. One should spend at least one night here and also do Parikrama.